What do I need to consider when creating indoor/outdoor flow? Depending on the current layout of your property and how you intend to use your outdoor space, considerations will vary. However the consistent factor with all outdoor living areas in NZ is climate. While the summer months lend themselves to socialising outdoors, our inconsistent weather and varying temperatures throughout the middle of the year means your outdoor living space needs to work to combat these elements and minimise their effect. It’s hard for a Kiwi to catch a break when we are trying to enjoy ourselves outdoors. We are either being roasted by our harsh sunshine, rained on by a passing shower, or blown away by random wind gusts. 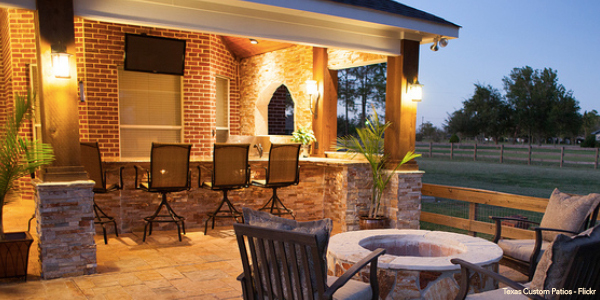 No matter what the weather – your outdoor space needs shelter. Fortunately you have a lot of options – including awnings, umbrellas, gazebos, pergolas and sails – depending on your budget. Outdoor heating allows you to get the greatest value out of your investment in an outdoor living space as it lets you utilise the area all year round. While there are many options the most cost-effective, energy efficient solution is roof mounted, electric heaters. Auckland based outdoor heater manufacturer, Kelray Heaters produce a range of outdoor infrared heaters which are specifically designed for NZ’s salt-laden air. Unlike traditional gas powered heat lamps which simply heat surrounding air, infrared heaters act similarly to the Sun’s rays, with heat waves being absorbed only by solid objects. This makes them the most efficient patio heating solution. Outdoor lighting needs to be practical as well as decorative. By illuminating certain features of your yard such as paths, plants, ornaments and seating, you create an aesthetically pleasing night time environment. The two main options for landscape lighting are 12V and solar powered each of which can be LED or halogen. The solution you select will be based on the intended use of your outdoor area as well as any limitations. When it comes to creating an attractive, liveable outdoor space in NZ the items highlighted above – shelter, heating and lighting, are really the bare minimum. When it comes to other considerations such as outdoor furniture and appliances, this really depends on what you intend to use this space for. Be sure to closely define what you want to get out of your newly created space, before undertaking any significant project.